Kovind’s promise comes as BJD smoothed out whatever differences it had within its ranks on the party's support for the NDA candidate. NDA's presidential candidate Ram Nath Kovind (right) with Odisha CM Naveen Patnaik. BHUBANESWAR: National Democratic Alliance's (NDA) presidential candidate Ram Nath Kovind met with Bharatiya Jantha Party and Biju Jantha Dal leaders in Odisha and promised that he would not allow the state to be neglected as in the past. Addressing the BJD lawmakers in the assembly conference hall on Friday, he said he will act as per constitution and will do his duty, taking into account the federal structure. "I will try to ensure that no State or language is neglected," he said. The meeting started with an address by chief minister Naveen Patnaik. 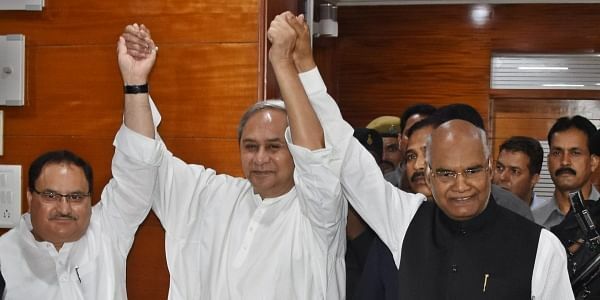 After that, Kovind sought support from the BJD lawmakers, several BJD leaders including food supply and consumer welfare minister Surya Narayan Patro, government chief whip Amar Prasad Satpathy, party MPs - Tathagat Satpathy, Dileep Tirkey and BJD parliamentary party leader Bhartruhari Mahatab also spoke about party’s stand in the presidential election. Briefing journalists after the meeting, BJD spokesperson Patro said the NDA presidential candidate praised the former chief minister late Biju Patnaik for his efforts to turn Odisha into a developed state. Kovind also congratulated Naveen for making Odisha a model state, he said. The BJD leaders maintained that though Odisha witnessed all-round development during the 17-year rule of the party, it had to fight Central government's neglect. Odisha faces natural calamities including drought and flood every alternate year, but assistance from New Delhi is negligible, Tathagat Satpathy reportedly said. After the hour-long meeting ended, Kovind went to have lunch at the chief minister's residence. After lunch, Kovind thanked BJD for supporting his candidature. Then he visited the residence of BJP leader KV Singhdeo where he met BJP MLAs. Earlier, both parties gave him a rousing reception at the airport, upon his arrival. He was accompanied by union health minister JP Nadda. Union minister for tribal affairs Jual Oram, state BJP president Basant Panda, Singhdeo, former BJP minister Manmohan Samal, senior BJP leader Sajjan Sharma, Odisha finance minister Shashi Bhusan Behera, BJD vice-president Debi Mishra and Patro received him at the airport. There was resentment within the ranks of BJD after chief minister extended support to NDA presidential candidate. However, the chief minister ruled out the possibility of cross voting from BJD in the presidential election.